Last night, a new era in late night was ushered in when The Tonight Show Starring Jimmy Fallon premiered after NBC's Olympic coverage. As we reported last week, Jimmy Fallon's first guests were Will Smith and U2, but they weren't the only celebrities who showed up. In case you missed the show, NBC has released six clips from the premiere, featuring Jimmy Fallon's monologue, the "Evolution of Hip-Hop Dancing" video with Will Smith, and the $100 Tonight Show bet skit, which featured a host of cameos including Robert De Niro, Lady Gaga and Stephen Colbert. Check out these videos, then read on for details about what guests Jimmy Fallon will have on during his second week on the air. 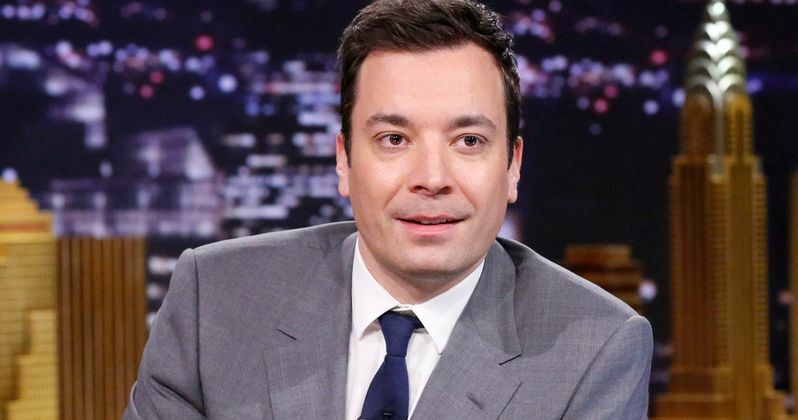 In addition to these clips, NBC has announced The Tonight Show Starring Jimmy Fallon lineup for its second week, from February 24 to February 28, which you can take a look at below. Monday, Feb. 24: Guests include Reese Witherspoon, Fred Armisen and musical guest Rick Ross with The Roots. - Tuesday, Feb. 25: Guests include Paul Rudd and Shaquille O'Neal. - Wednesday, Feb. 26: Guests include Drew Barrymore and Adam Sandler (appearing together) and musical guest Dierks Bentley. - Thursday, Feb. 27: Guests include Denzel Washington and TBD. - Friday, Feb. 28: Guests include Cameron Diaz and Mike Tyson.